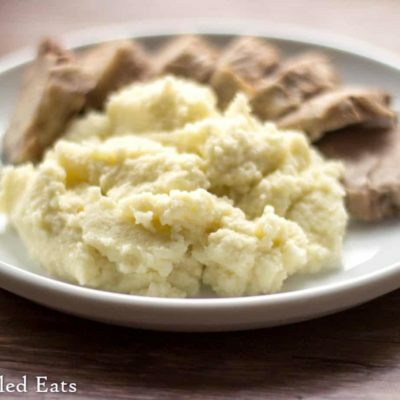 I guarantee this is the Best Mashed Cauliflower without Dairy you have ever tried! Process the cauliflower in a food processor until chopped. Add the other ingredients. Process until smooth and creamy, scraping down the sides as needed. Heat and serve. You can easily double this recipe to serve 4-6 people using 24 oz cauliflower, 2 tbsp almond milk, 2 tbsp mayo, 4 tbsp buttery coconut oil, and 1/2 tsp salt.